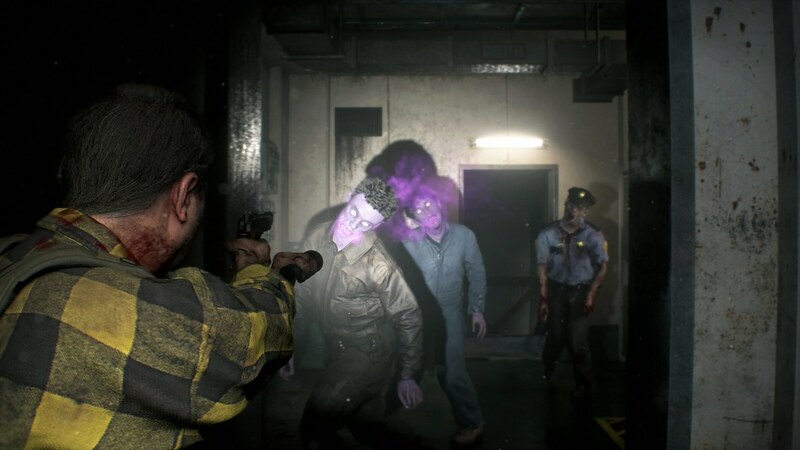 This set of stories provides “what if” scenarios for characters you encounter throughout the main game, providing an alternate look at what things might have been like if they survived the horrors of Raccoon City. There’s a good chance you’ve seen or played The 4th Survivor, a tough-as-nails additional mode that follows Umbrella Security Services (U.S.S.) agent Hunk as he escapes from the depths of the city in order to complete his mission, or The Tofu Survivor, a non-canon gameplay mode which follows a particularly determined block of bean curd doing its best to avoid certain death (and maybe being sautéed with some vegetables and spices). No Time to Mourn features Robert Kendo, owner of the famous (and aptly named) Gun Shop Kendo. Those who have played the game may already know how his sad tale ends, but in The Ghost Survivors, he’s given a second chance when an old friend with a helicopter radios in to pick him up. Packing up what weapons he can, Kendo sets out into the streets to seek a way out from the infected city. On his way, a new type of poisonous zombie stands between him and freedom. Way before the events of Resident Evil 2 took place, the fate of the mayor’s daughter, Katherine, was already sealed. In Runaway, her story takes her down a very different path. Seeking to escape Raccoon City with a certain someone, Katherine Warren must navigate the streets while avoiding a strangely mutated type of zombie that can only be stopped with particularly powerful ammunition. Play carefully, and you might survive. Out of the shadows comes a forgotten U.S.S. agent. Thought to have been wiped out with his squad, the appropriately named Ghost makes his debut in Forgotten Soldier. Deep within the laboratory underneath the city, another soldier (besides Hunk) attempts his escape. Having to deal with hordes of monsters is bad enough, but what do you do when they’re covered in armor? This especially challenging scenario will put even The 4th Survivor veterans to the test. Finish each scenario on its regular difficulty, or give them a shot in the unique Training mode. Unlike other modes, Training will lower the difficulty a bit by giving you additional items and item slots to start out with, and makes a great way to learn enemy positions and routes before you tackle each scenario on their standard, more challenging difficulty. It’s also a great way to understand some of the mechanics of The Ghost Survivors. Unlike The 4th Survivor and The Tofu Survivor, you can pick up more than the items you start with, but instead of finding items in the environment, you’ll find pickups by defeating specific zombies with backpacks, or grabbing items out of vending machines. Choose carefully, though; once you take an item from a vending machine, you’re locked out of the other two items for that run! Plan ahead, and you just might make it through. There’s plenty to do across these three “what if” scenarios. Alongside bragging rights for completing each scenario, you’ll also have access to fun new challenges and Trophies specific to The Ghost Survivors. 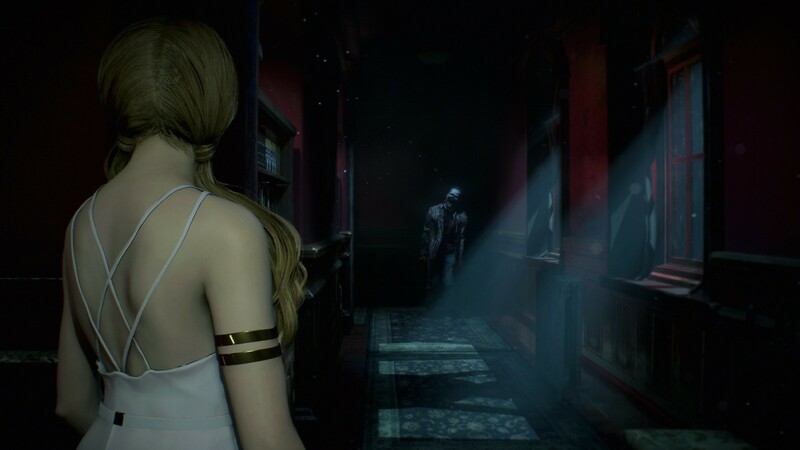 Three imaginative scenarios await you in The Ghost Survivors, out 15th February as a free update for Resident Evil 2 on PlayStation 4. Don’t forget to swing by PlayStation Store to grab free ’98 Costumes for Claire and Leon, also available on the 15th. These costumes are just as polygonal as you remember from the original Resident Evil 2, and make for a great nostalgia trip. See you all in Raccoon City.